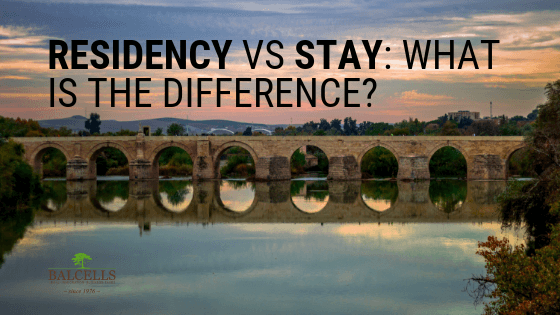 Residency vs Stay Status in Spain: What is the Main Difference? Residency vs Stay Status in Spain: What is the Difference? No one would deny the fact that Spain is one of the prefered destinations for expats worldwide. Life in the country is, among other things, delightful. Nevertheless, in order to start living the “Spanish dream”, you need to have your legal status in place. And then is when the concept of residency and stay status come in to play. Which is the main difference between both? In which situations can you get one or the other in order to live legally in Spain? In this post, we are going to answer those questions and many others. Are you ready? What is the difference between residency and (short) stay status in Spain? Basically, the residency is granted to those individuals who, after meeting the required needs, want to live more than 3 months in the Spanish territory. On the other hand, stay or short-stay visa is the status conceded to immigrants who just want to be in the country for less than 3 months, under certain requirements. Let’s analyze each one with more detail, defining for which situations the stay will be conceded, and which are the different kinds of residencies and how to obtain them. Are you planning to stay for just 90 days or less (3 months) in Spain? Then the stay status is what you will be conceded. But, does that apply to all the cases and citizens? Not at all. If you are from a European Union country, with just the passport and ID you can have access to the short-stay visa, which will NOT enable you to work in the country. Relatives from an individual who is from an EU country who come as accompanists (even if they are not from any of those countries themselves), can also have the possibility to live in Spain for less than 90 days with their passport or ID. We would like to point out one important point here: with the short-stay visa in Spain, you won’t be allowed either to work in the country or to pay for social security contributions. This status just grants you the possibility live legally in the country in order to do one of the following. ON WHICH OCCASIONS CAN YOU GET THE SHORT-STAY STATUS IN SPAIN? We will analyze the case of staying due to study purposes with more detail as it is the most extensive in terms of related legal issues. Let’s say you would like to do your masters or P.h.D in Spain. Then, and if the course or research will last for less than one year, you do not need to possess a residence permit (student visa) in order to reside legally in the country. The Spanish immigration law contemplates this situation and you will be granted the stay status. As you can see, the main upside of this is that you can skip all the legal paperwork of applying for an actual visa. The downside is that that period will not count for your Spanish nationality (remember that in order to obtain the Spanish citizenship you need to accumulate a certain amount of years lived in the country). And what happens when your studies or research have finished? Well, in that case, you can switch to a special residency that allows you to work as a former student. Under which conditions can you go for this procedure? You need, at least, 3 years of having studied in Spain. You need to prove that you have harnessed those 3 years productively (that means, really studied). Having any kind of scholarship will deny your access to it. You need to provide the job offer you have found, and that must be related to what you have studied in Spain. AND… WHAT HAPPENS WHEN MY SHORT-STAY VISA TIME IS OUT? When the 90 days come to an end, you will have two options. The first option is to ask for an extension of the “stay status”. In order for that prorogation to be accepted, you will need to prove that you have sufficient funds to sustain yourself in the country, justifying which is the reason you demand an extension, and finally showing any guarantee that demonstrates that you will go back to your country. On the other hand, and if you are considering moving into Spain for the long-run, you can ask for a residency authorization, which is a regular residency permit. The residency is the legal status granted to those individuals who are willing to stay in the country for the long-run. That is, for a period longer than 90 days. In this sense, there are two different kinds of residencies in Spain: the temporal residency and the permanent residency. The temporal residency is the long-run residency status that enables you to live in Spain for longer than 90 days, but for less than 5 years. It requires the application for a regular residency permit and depending on whether you are planning to embark in any economic activity in the country or not, you can apply for the non-lucrative residency (if you have sufficient funds and you are not willing to work in the country); or for the different types of lucrative residencies. Which are the different options you can have in order to obtain your residency permit and thus being able to live in the country for 5 years (with yearly renovations of that residency)? If you are willing to study in Spain for more than a year at a public or private institution, you will need to obtain a student visa. How can you apply for this kind of temporal residency? You need to submit the enrolment document from the university or centre, prove that you have sufficient funds and demonstrate that you have a health care insurance. This are the main requirements. If you have a job offer from a company in Spain, you can apply for the work employed residency, the so-called “trabajo por cuenta ajena”. On the other side, if you are willing to start your own company and work as a self-employed, you can apply for the “trabajo por cuenta propia” permit. In this concrete case, you will need to provide some proof of the status, which in many cases is the document of your company in the Trade Registry of Spain (Registro Mercantil). This kind of permit is also called the entrepreneur visa. If you are willing to start your company in Spain, we can help you both by making sure you obtain your permit, and also with your business plan. Our business lawyers will be glad to turn your project into a success! If you are the relative of someone who is a European Union citizen (being because she was born in any of those countries or because she obtained the residency there), you can get the residency in Spain. Let’s say, for example, that you have a relative who is going to start studying in the country with the student visa. Well, in that case, you can also get your residency permit. Other cases include those individuals from outside the European Union who got registered through a civil union in Spain. They can also apply for the residency as a family member of an EU citizen, now their new registered partner. Finally, the permanent residency; also called the Spanish nationality or citizenship. This type of residency will enable you to not only live in the country indefinitely but also to live and work with the same rights as a Spanish citizen. Among others, you will be granted the right to vote for the elections in the country. The procedure and requirements needed to get the Spanish citizenship vary depending on your country of origin, as the number of years you must live in Spain in for eligibility will be higher or lower. If you need more information regarding the Spanish nationality or any other type or residency permit, do not hesitate to ask: our immigration lawyers are always ready to help! Sure, we have lawyers who are specialized in the area of business for expats, so we will be more than happy to help. If you send us an email to info@balcellsgroup.com, we will start with your company as soon as possible! Please thank for your email. Am not from the EU or European union, how could I obtained residents permit in Spain here? I’ve been here since 16th August 2018 up to now. You have different residency permits in Spain, and depending on your specific situation one would be more recommended than the other one (student visa, golden visa, work permit…). Therefore, what we recommend you is to send us an email to info@balcellsgroup.com and detail your situation, so a specialized lawyer can analyze your case and help you telling you which is the best path for you to follow! In order to answer your question, we would appreciate if you could send us an email to info@balcellsgroup.com so a specialized lawyer can help you directly.